Complex of lactic acid, bifidobacteria and Streptococcus in drops. Suitable for infants, babies and children, as well as adults and seniors. LYLBIOTIC Baby Professional is the only highly active complex of lactic acid, bifidobacteria and Streptococcus in drops available in Latvia with such a high number of bacteria and broad range of diversity. LYLBIOTIC Baby Professional contains high-quality good bacteria processed by a special technology. 1 drop of LYLBIOTIC Baby Professional suspension contains 1 billion of the same bacteria that reside in the human gastrointestinal tract. 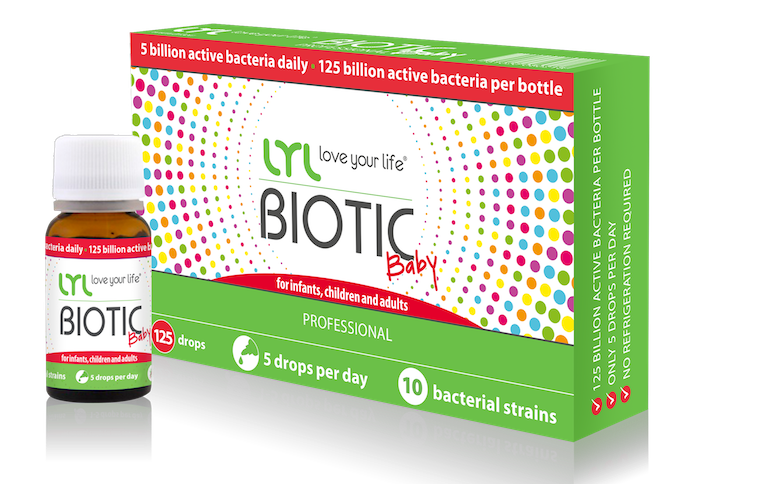 LYLBIOTIC Baby Professional contains for Latvia an unprecedented amount of bacteria per bottle – 125 billion CFUs and 10 different species of microorganisms: Bifidobacterium bifidum, Bifidobacterium breve, Bifidobacterium longum, Lactobacillus acidophilus, Lactobacillus casei, Lactobacillus helveticus, Lactobacillus plantarum, Lactobacillus rhamnosus, Lactococcus lactis ssp lactis, Streptococcus thermophlus. The bacteria have been obtained by the innovative lyophilization method or freeze-drying, which guarantees that the bacteria are activated only in the acidic environment of the intestines. The innovative form of the bacteria provides a rare benefit – LYLBIOTIC Baby does not need to be refrigerated. 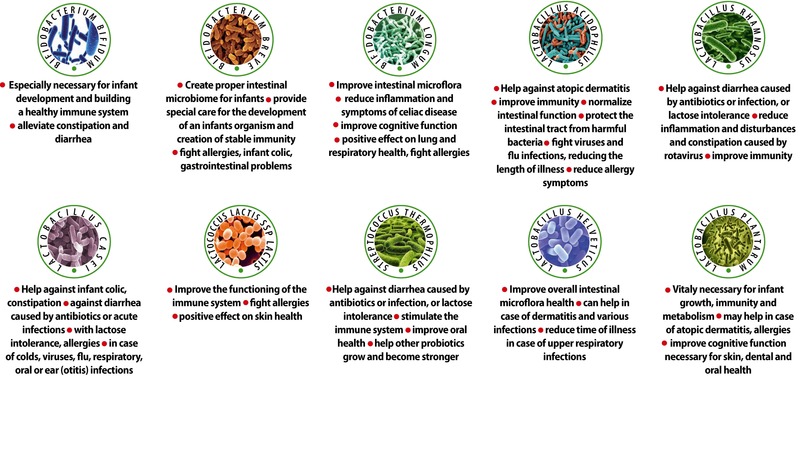 LYLBIOTIC Baby Professional is one of the rare probiotics on the market, which is a purely probiotic/prebiotic product without any fillers. It does not contain artificial colorants, gluten, preservatives, salt or yeast, allergens, heavy metals or GMOs. Vegetarian friendly. 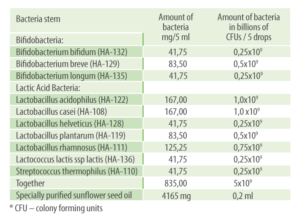 Specially purified sunflower seed oil, bacteria: Lactobacillus acidophilus, Lactobacillus casei, Lactobacillus rhamnosus, Lactobacillus plantarum, Bifidobacterium breve, Bifidobacterium bifidum, Bifidobacterium longum, Lactobacillus helveticus, Lactococcus lactis ssp lactis, Streptococcus thermophilus. Genetically modified ingredients, artificial colorants, gluten, preservatives, salt or yeast. Suitable for vegetarians. Does not contain the allergens listed in Regulation (EU) No. 1169/2011 of the European Parliament and of the Council. The probiotic is in drops, thus it is easy to use if swallowing capsules is difficult. The drops can be administered directly into the mouth or on the pacifier for small children, in a spoon or over food for older children and adults. Shake the bottle before each use. The product does not need to be stored in the refrigerator, thanks to the lyophilization method, it can be stored at +5 o C – +25o C.
The product can be used during or immediately after a course of antibiotics. Please consult your doctor regarding use during an antibiotic course. 1-5 drops per day, taking with water or according to doctor’s orders. In order to guarantee better survivability of the bacteria, it is not recommended to take the product together with food or drinks hotter than 37o C.
LYLBIOTIC Baby Professional is recommended for both prophylactic and acute use. Do not exceed the recommended daily dose. Dietary supplements do not replace a comprehensive and balanced diet. Do not use after the expiration date indicated on the packaging. Keep away from children. Does not contain genetically modified ingredients, artificial colorants, gluten, preservatives, salt or yeast. Suitable for vegetarians. Does not contain the allergens listed in Regulation (EU) No. 1169/2011 of the European Parliament and of the Council.